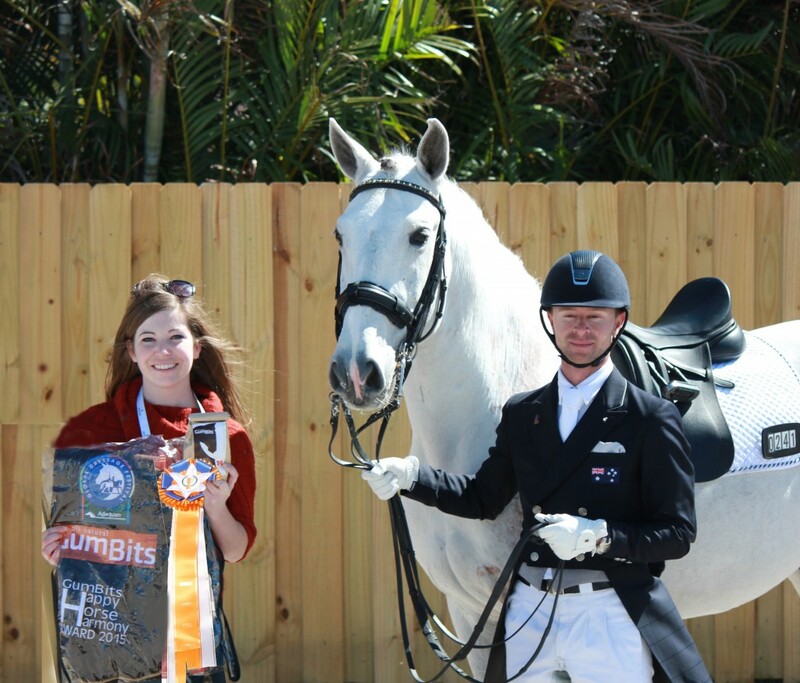 Wellington, Florida (December 22, 2015)-- GumBits, a sponsor of the 2015 Adequan Global Dressage Festival, was pleased to wrap up a successful season by awarding their Happy Horse Harmony Award to Dressage professional Adam Steffens and his mount Regatta at the White Fences Polar Express Dressage Show this past weekend. Mares hold a special place in Steffens heart- especially mares that are nervous and need a little extra help doing their best in the show ring. Although good tests and blue ribbons are a perk, for Steffens, there's nothing more rewarding than helping a anxious horse learn to love being competitive again. The United States Eventing Association (USEA) is excited to announce a new partnership with GumBits. The company joined the USEA as a sponsor in 2015, and showed its support as a Contributing level sponsor at the 2015 Nutrena USEA American Eventing Championships. (June 18 , 2015) -- The maker of GumBits (Gambit Atlanta, Inc.) is thrilled to announce the newest addition to its talented team of sponsored riders - Canadian Eventer Hawley Bennett-Awad. Wellington, FL-- It has been an exciting year for talented eventer Lauren Kieffer. Since earning the title of 2014 U.S. Eventing Leading Lady Rider last year, Kieffer has continued to flourish. She began 2015 by becoming a GumBits Ambassador, using the small sweet treats called GumBits to help relax her horses before training and competing. It is now with great excitement and pride that the company GumBits congratulates Kieffer on being named to the U.S. Pan American Games Eventing Team. Kieffer will compete on Marie Le Menestrel's Meadowbrook's Scarlett, a 2007 Thoroughbred mare; and will also be an alternate on another mount, Jacqueline Mars's Vermiculus, a 2007 Anglo-Arabian gelding. 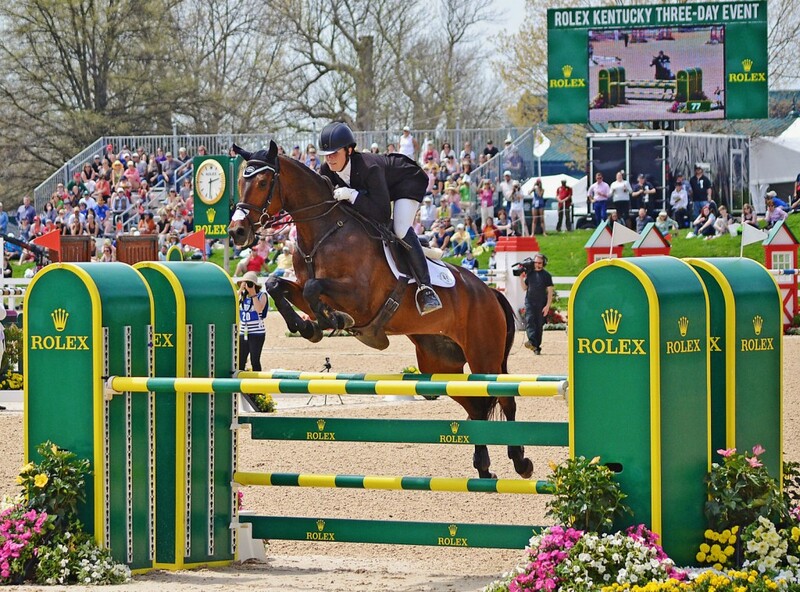 WELLINGTON (Gumbits) -- It has been an exciting year for talented eventer Lauren Kieffer. Since earning the title of 2014 U.S. Eventing Leading Lady Rider last year, Kieffer has continued to flourish. She began 2015 by becoming a GumBits Ambassador, using the small sweet treats called GumBits to help relax her horses before training and competing. It is now with great excitement and pride that the company GumBits congratulates Kieffer on being named to the U.S. Pan American Games Eventing Team. Kieffer will compete on Marie Le Menestrel's Meadowbrook's Scarlett, a 2007 Thoroughbred mare; and will also be an alternate on another mount, Jacqueline Mars's Vermiculus, a 2007 Anglo-Arabian gelding. Jacksonville, FL -- John Zopatti, four-time Gold Coast Dressage Association Trainer of the Year and USDF Gold medalist, rode KWPN-Half Arabian gelding Uwannabeme WH straight down centerline to the Third Level Open Championship at the May Day Dressage Qualifier One hosted at the Jacksonville Equestrian Center in Jacksonville, Florida. The pair delivered solid performances and scored in the 70's. Uwannabeme, who has been with Zopatti since February, has been growing in strength and confidence. The pair's skills were evidenced by their consecutive USEF Third Level winning rides and a final 71.212 percent flourish of a finish to close the show. Newberry, FL - During Mikhayla Daugherty's third time at a rated competition, she and So Fan See That demonstrated their excellent partnership and won the GumBits Happy Horse Harmony Award. The two, who are both seventeen-years-old, competed in the Hunt Seat Equitation, English Trail, and Showmanship divisions at the recent Arabian Horse Celebration in Newberry, Florida. Their communication and teamwork was evident as the pair competed - and won - in several different classes. "Mikhayla's family wasn't originally planning on getting a horse," explained Daugherty's trainer Laurie Salmi. Katherine Arthur and the 6-year-old Irish Sport Horse gelding New D'Or (Womanizer-DBA Rosanne, Dauntless Prince), owned by Kevin Keary, are poised to take show jumping by storm. The Ireland-based Arthur bred Nemo and has trained him at Kear'ys farm in County Galway, Ireland, Where she and Keary breed and train a small number of horses. Arthur knows that careful, consistent training while keeping her horses willing and happy is the key to success. One of her tools to achieve these goals is using GumBits. GumBits promote the horses' salivation process, and help eliminate the teeth grinding that can occur during the intense training of high performance sport horses. Wellington, Florida)-- Harmony between horse and rider is crucial no matter what level you're competing at, and riders Laura Graves and Rikke Poulsen are fantastic reminders of that. Both Graves, a talented Grand Prix rider who most recently represented the U.S. in the Nation's Cup, and Poulsen, a dressage rider and jumper dedicated to bringing along young horses, were recently rewarded for their dedication to having a great partnership with their horses through the GumBits Happy Horse Harmony Award. Wellington, Florida (April 9, 2015)-- Harmony between horse and rider is crucial no matter what level you're competing at, and riders Laura Graves and Rikke Poulsen are fantastic reminders of that. Both Graves, a talented Grand Prix rider who most recently represented the U.S. in the Nation's Cup, and Poulsen, a dressage rider and jumper dedicated to bringing along young horses, were recently rewarded for their dedication to having a great partnership with their horses through the GumBits Happy Horse Harmony Award. GumBits Happy Horse Harmony Award Winner Rachael Hicks: Harmony is "The Whole Point"
Wellington, FL - For GumBits Happy Horse Harmony Award winner Rachael Hicks of Louisville, Kentucky, experiencing that oneness with her horses while riding is "The whole point, isn't it? I wouldn't put in the work if I didn't love getting in the saddle every day." Hicks, who winters in Wellington just a jog down the street from the Adequan Global Dressage Festival, is a student of Caroline Roffman of Lionshare Dressage. Hicks was riding her 2014 US Dressage Finals Third Level National Champion, Don Cartier, in his Prix St George level debut this season when their performance also scored the GumBits Happy Horse Harmony Award presented by Gambit Atlanta, Inc. The GumBits Happy Horse Harmony Award goes to riders at the Adequan Global Dressage Festival who demonstrate true partnership with their horses. Such pairs must exemplify shared harmony through such classical characteristics as an eagerness to please, soft expression, and suppleness. Wellington, Florida (March 2, 2015) -- Gusts of wind and unusually chilly weather at the show grounds created a difficult ride for many last week at the 2015 Adequan Global Dressage Festival, but the tense atmosphere made those truly harmonious rides all the more impressive. 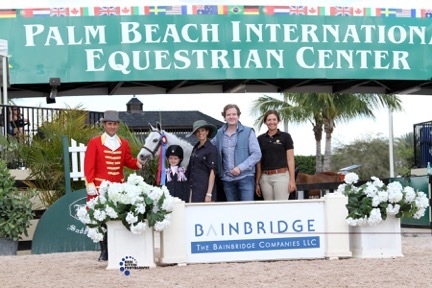 Among the outstanding pairs drawing spectators' attention were international dressage rider Nicholas Fyffe and nine-year-old Lusitano gelding Banzai LS (owned by Ginette Brockway), whose strong performances earned them the GumBits Happy Horse Harmony Award. Wellington, Florida , United States (Feb 20, 2015) - GumBits, made by Gambit Atlanta, Inc., has supported the USEF community for over a decade. This month, GumBits sweetened a "Develop a Winning Hunter Ride" clinic by sponsoring the event and supplying its participants and guest instructor-- 2008 World Champion Hunter Rider Sandy Ferrell-- with GumBits gift samples. The clinic was part of the weekly Ride & Learn Series being hosted by the 2015 Winter Equestrian Festival in Wellington, Florida. Wellington, FL (February 17, 2015)-- "A happy horse is an expressive horse, and Cerro is very happy 4 days ago - looking for cheap estrace ? not a problem! click here in the event you would love to receive details concerning estrace generously visit about getting a package of GumBits. He gets GumBits daily," a delighted Lisa Wilcox said while accepting the GumBits Happy Horse Harmony Award after placing in the top five in both the FEI Grand Prix and FEI Grand Prix Freestyle during Week Five of the Adequan Global Dressage Festival in Wellington, Florida. GumBits, made by Gambit Atlanta, Inc., are horse-sized treats designed to encourage salivation and soften the mouth. Gambit Atlanta, Inc. is presenting the GumBits Happy Horse Harmony Award throughout the 2015 Adequan Global Dressage Festival to the most harmonious horse-and-rider teams. Wellington, FL -- GumBits, made by Gambit Atlanta, Inc., has supported the USEF community for over a decade. This month, GumBits sweetened a "Develop a Winning Hunter Ride" clinic by sponsoring the event and supplying its participants and guest instructor- 2008 World Champion Hunter Rider Sandy Ferrell- with GumBits gift samples. The clinic was part of the weekly Ride & Learn Series being hosted by the 2015 Winter Equestrian Festival in Wellington, Florida. During week three of the 2015 Adequan Global Dressage Festival, Tanya Strasser-Shostak rode her mother Evi Strasser's Oldenburg gelding Action Tyme into the limelight. The Canadian pair brilliantly performed the FEI Young Riders Prix St. George team test, earning a 66.053 percent and a second place finish. Strasser-Shostak also successfully competed Deluxe Tyme, also owned by Strasser. Strasser-Shostak's harmonious performance with her horses-especially Action Tyme- was rewarded with the GumBits Happy Horse Harmony Award, which is presented to riders who demonstrate true partnership through harmonious rides. GumBits will be presenting the GumBits Happy Horse Harmony Award to deserving riders at every CDI of the twelve-week international show. Winning pairs must demonstrate true harmony through characteristics like an eagerness to please, soft expression and suppleness throughout the back. Wellington, FL (January 29, 2015) -- The maker of GumBits (Gambit Atlanta, Inc.) is thrilled to announce the newest addition to its talented team of sponsored riders -- 2014 USEA Lady Rider of the Year, Eventer Lauren Kieffer. As the first-ever $50,000 Wellington Eventing Showcase approaches, GumBits plans to help Kieffer and her mount Czechmate achieve an exceptional ride. Wellington, FL (January 19, 2015) -- A quiet mouth, soft expression, and suppleness throughout the back are cornerstone characteristics of a horse that is in harmony with his rider. Teresa Simmons' Oldenburg Stallion canadian pharmacy: we provide world wide shipping, cheap prices and no prescription: where can you buy atarax, suhagra 100 india, buy ampicillin no rx, - Royal Prinz by Royal Diamond showed off these traits while being ridden by Mary-Cameron Rollins during week one of the 2015 Adequan Global Dressage Festival. Rollins's harmonious performance not only earned her the blue ribbon in Friday's Prix St. George, but also earned her the first-ever GumBits Happy Horse Harmony Award. Wellington, FL (January 10, 2015) -- The maker of GumBits (Gambit Atlanta, Inc.) was chomping at the bit to get the winter show season of Wellington, Florida underway. At the 2015 Adequan Global Dressage Festival, GumBits is introducing its inaugural GumBits Happy Horse Harmony Award. The GumBits Happy Horse Harmony Award will be presented to a deserving rider at every CDI of the twelve-week international show.